For Mac OS X 10.9, 10.8, 10.7 and lower users, every time you connect your iPhone to your Mac computer, iTunes will ask if you would like to back up your iPhone file on the Mac. If so, after backing up, you can choose a password to encrypt the iPhone backup file. Thus, if you want to restore this backup, you must enter the red iPhone 7/SE/6plus/6/5S/5C/5/4S/4 backup password on Mac. Tip 2. Why need Mac iPhone 5S/5C/5/4S/4 Backup Password? Once if you encrypt your iPhone backup files with the iPhone backup password on your Mac OS X, others can't restore the confidential files from the Mac computer without that password through iTunes. But if you forgot Mac iPhone backup password accidently, you need to find it back in case that you will lose the access to restore from iPhone 5S/5C/5/4S/4 backup file forever. Fortunately, here are two ways for you to recover iPhone backup password on Mac – Keychain and iTunes Backup Password Recovery for Windows. Tip 3. 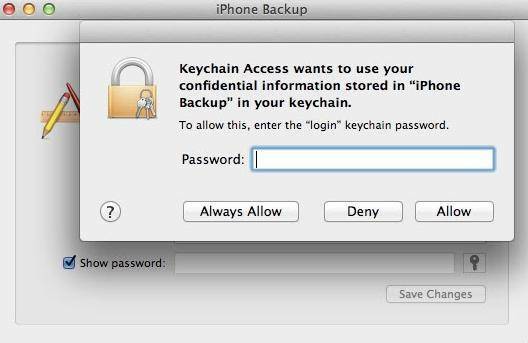 How to Unlock iPhone 5S/5C/5/4S/4 Backup Password on Mac OS X? Keychain access Utility is a built-in application on Mac computer. You can check most of your passwords in it, including Wi-Fi passcode, iPhone backup password etc. So let's crack iPhone backup password by checking the user's keychain. 1. Open the Keychain Access utility from Application > Utilities. Note: Make sure the on the left side "All items" is selected under categories. 2. In the upper right search field enter "iPhone" and then look for a keychain item named "iPhone Backup" of kind "application password". 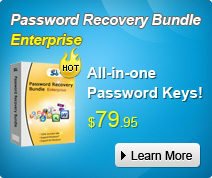 If there is no such a item, turn to iTunes Backup Password Recovery for Windows for help. 3. Double-click on the "iPhone Backup" entry and in the new window that will open, click on the "show password" checkbox. 4. 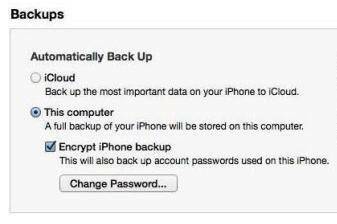 You will now be prompted to enter your password (the one your user has on your Mac) to show the iPhone backup password; click Allow (once). You should now see the iPhone Backup password in clear text. First, transfer your iPhone backup files from Mac computer to a Windows PC. Thus you can unlock iPhone backup password with only a few clicks by using iTunes Backup Password Recovery. Go through the following steps to achieve it when you forgot iPhone backup encryption password for Mac. 3. Run iTunes Backup Password Recovery on Windows and select an Attack type to crack the forgotten iPhone 5S/5C/5/4S/4 backup password. 4. Click "Start" to unlock iPhone backup file password on Mac. 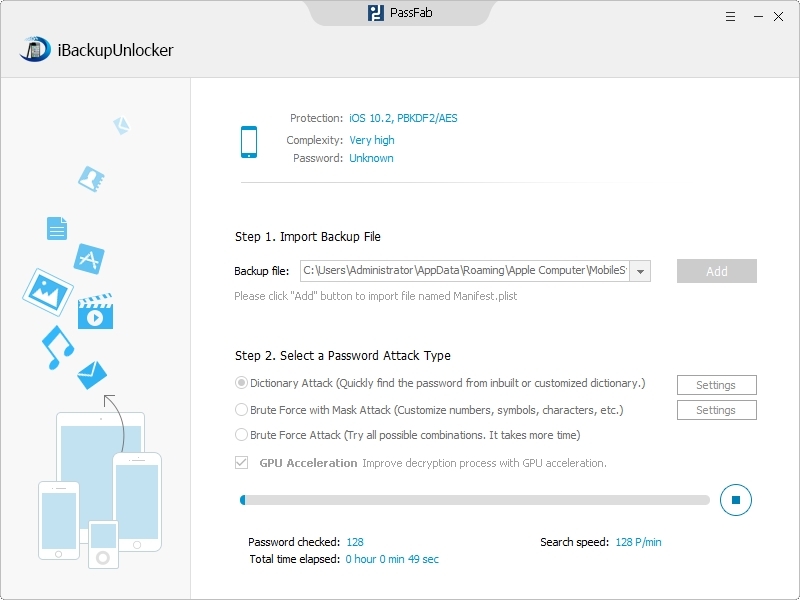 After knowing these tips of iPhone backup password for Mac OS X 10.9/10.8/10.7/10.6 and lower versions, you can enjoy your iDevice more smoothly.